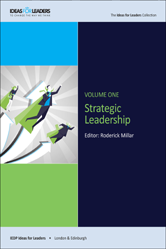 Ideas for Leaders curates the latest and most significant management and business thinking from around the world and distills often highly complex concepts into straightforward summaries which highlight how ideas can be applied to improve organizational performance. The information from which the Ideas are produced represents over a billion dollarsâ worth of research conducted at top business schools around the world. The material introduces students and other readers to the new thinking that is revolutionizing how we manage people and organizations. Identity Crises: Occupational Hazards for Female Leaders? Indirect Control: The Future of Management? Ascent to the Top: Which Leaders Get to be CEO? Do Ivy League or Elite Educated CEOs Outperform Others? Facial Cues: Can We Judge Who Looks Like a Leader? Home Working: Does it Work for the Organization? The ‘Brazilian Way’: The Future for Africa? Innovation Partnerships – Loosely or Tightly Coupled? Should Technology Innovators Participate in the Commercialization Process? Integrated IT Outsourcing: Total Package or Total Chaos? Is Your Supply Chain Prepared for the Unexpected? Is There an Open Business Model Right for Your Company? Conducting Better Meetings - Can Data Help? Music in the Meeting Room: Beethoven's 9th? How Reference Points Motivate Us? Can Emotional Intelligence Shape a Team's Collective Performance? Can Late-Night Smartphone Use Reduce Engagement and Productivity? What is the Psychology Behind Resistance to Change? Product Choice: Are You Paying Attention? Search Engine Marketing: Does it Pay? Co-creating with Customers: More Pros than Cons? Ambiguous Ads: Hidden Messages, Hidden Risks? What Is the Real Value in CSR? Do CSR Initiatives Enhance Customer Loyalty?